Ryanair is to cancel 30 of its 290 scheduled flights in and out of Ireland on Thursday due to a planned strike by pilots. The airline has said that it is cancelling flights on high-frequency routes to and from the UK where passengers can easily be rescheduled. The cancellations are due to a strike by Irish-based directly employed pilots at the airline. Customers on affected flights received notification of the cancellation by text and email earlier today, the company said. These customers will receive refunds and/or free transfers to alternative flights, it said. Ryanair also said customers who have not received notification of a cancellation should check-in as normal on Thursday. The 24-hour stoppage will begin at 1am on Thursday, but the scale of disruption is unclear, as only up to 120 directly employed pilots will be striking, while more than 250 others who are employed as contractors or agency personnel will work as normal. Management and unions are due to meet at 10am tomorrow at Terminal 1 in Dublin Airport. The Commission for Aviation Regulation has published information on entitlements for passengers affected by flight cancellations or delays on its website. If you choose to be re-routed as soon as possible, Ryanair must provide you with care and assistance while you wait for the alternative flight. The Commission for Aviation Regulation advises that if Ryanair fails to provide such care and assistance passengers should make their own reasonable arrangements, but keep all receipts. They should then submit copies of the receipts directly to Ryanair. Where flights are delayed for over two hours, Ryanair must provide care and assistance. If the delay exceeds five hours, Ryanair must offer passengers a choice between continuing their journey or a full refund of the cost of the ticket. The commission stressed that passengers may not travel and simultanously avail of the full refund. On the issue of compensation, the commission said passengers were entitled to compensation where a flight is cancelled or delayed by more than three hours, except where the cancellation or delay is due to "extraordinary circumstances". It advises affected passengers to contact Ryanair directly. Meanwhile, a Dutch court has ruled that Ryanair employees based in the Netherlands are covered by Dutch law, rather than by Irish law as claimed by the airline. Ryanair was appealing a lower court ruling which found in favour of a Dutch-based cabin crew member who took a case after she was dismissed after refusing to transfer from Eindhoven to Dublin. 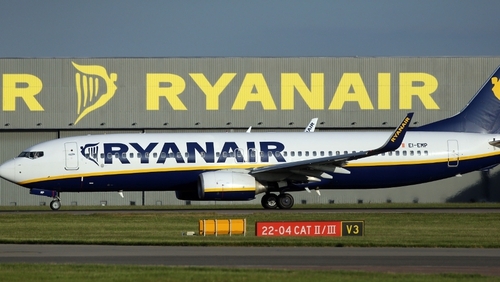 The court awarded the employee €25,000 in compensation after rejecting Ryanair's argument that Irish law was applicable to its employment contracts - because the planes fly under Irish flags, and the workers in question work on board Irish planes. Unions representing Ryanair workers across Europe have long demanded that their employment contracts should be governed by the law of the country in which they are actually based. Meanwhile, Ryanair has instructed its lawyers to appeal the Dutch court ruling. Also today, the British Air Traffic Control provider NATS disputed Ryanair claims that staff shortages at its operation were leading to delays for airlines. Ryanair has been tweeting details of alleged delays to its services and attributing those delays to the failure to roster sufficient staff shortages and strikes at air traffic control operations around Europe. However the British ATC operators, which manages around 25% of European aviation traffic, retaliated by saying there were no ATC delays in the whole of the UK on Sunday or Monday. Last month the European umbrella body for air traffic control, Eurocontrol, warned that delays would be up 53% this year compared to 2017 because of strikes, capacity or staffing shortages and weather.